The Rainbow Bridge on the Lincoln Highway near Donner Summit. The Lincoln Highway (State Route 40) over Donner Summit and through Truckee was part of the first transcontinental Highway. In 1912 there were few good roads, so Carl Fisher came up with the idea of a coast-to-coast highway. Fischer had other big ideas, like paving the Indianapolis Motor Speedway with bricks and draining the swamps in Miami to create a beach resort. A man named Henry Joy came up with the idea of naming the highway after Abraham Lincoln. Fischer liked the name, so the two collaborated and lobbied Washington for support and money for the project. The highway went through several route changes through the years as usage increased. The original route came down Donner Summit as a one lane dirt road. 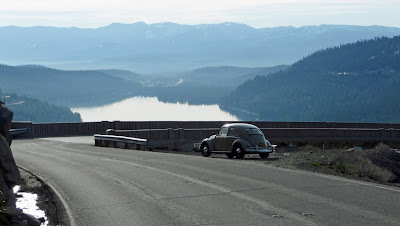 It then followed the current Donner Pass Road through Truckee, north on Hwy. 89 and out Prosser Dam Road. Glenshire Drive later became a second generation route out of Truckee. When Interstate 80 was completed in the early 60’s, the Lincoln Highway began to fall by the wayside in many areas. However, the route over Donner Summit and along Donner Lake is in use every day by tourists and locals. The Lincoln Highway Association is dedicated to remembering the old highway. Truckee route, click to enlarge.